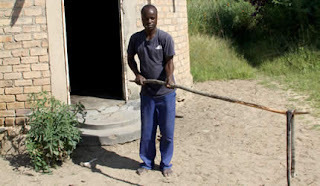 A man from Domboshava could not hide his secret anymore and decided to come in the open in a desperate search for help. Tawanda Chinyani aged 30 from Makumbe area in Domboshava confessed that he drinks human blood and eats human flesh. Tawanda is married to his 29 year-old wife Erita Karipo. When asked why he decided to drink human blood and eating human flesh, Tawanda could not control tears running down his cheeks. Tawanda said that his craving for human blood started when he visited a church in Harare where he had gone searching for spiritual help. Tawanda said that he did not intentionally chose to become a Satanist. "I cannot deny that I'm a Satanist. I got this (Satanic spirit) from a church situated in Harare city centre where I had gone to seek prayers. I went to Harare with my wife to buy her kitchen property but while there I got really sick," he said. Tawanda claimed that after getting sick he met two women who were clad in white apostolic sect regalia who invited him and his wife to the church in question. He said when he got to the church, there were two women who were standing by the entrance who greeted him before taking him into the church where he received prayers from other church members consisting of both men and women. Tawanda said during the prayer, a demon manifested but was immediately rebuked. "We later left the church and I was given US$5 as bus fare since they had asked my wife and I to call again next time we would come to church. Upon our way to Fourth Street Rank, I started having difficulty in walking. It took me 20 minutes to just cross Julius Nyerere Way only. I was then feeling dizzy and weak," he said. Tawanda said the following day he went to church alone since his wife refused to return. He said at the church he was given some juice to drink and bread which was cut into three pieces. He said he was also given a church calender and an envelope which he was advised to keep money all the time. "They said I should keep one piece of the bread that they gave me in the pocket of my trousers then wash the trousers without removing the bread until it disappears. The other piece of bread was supposed to be kept in the envelope that they gave me which had the name of the church inscribed on it. The third piece was supposed to be kept together with my academic certificates. I precisely followed all this until this problem developed on 7 October last year," he said. It is alleged that on the first day Tawanda and his wife visited the church at the centre of controversy, their clothes, including the woman's blouse and their child's clothes were dipped in water as the church authorities claimed the 'ritual' would bring luck to their lives. "From that day I have always been dreaming of large snakes coiling around my body. I experience breathing difficulties whenever I start having these dreams. At times these snakes can talk though I will not understand what they will be saying. I have never seen these snakes before and there are no such snakes in Zimbabwe," he said. "At times I dream of accidents that take place throughout the country. When I visit the accident scene, I start sucking blood. I start acting like a snake at all accident scenes. I slither on my belly just like a snake and I also raise my head the way snakes do. I was also told to dry human flesh of accident victims before eating it," he added. The man said he tried to dump the envelope and the bread outside his house, but on the following day he mysteriously found the envelope back in the house. He also said he took the 'things' back to the church but they refused to accept them. They reportedly told him that all will be well eventually. He said at one time a relative gave him $400 for safe keeping and he placed it in the envelope and the following morning it was gone. He said he hardly sleeps and spends most of his time at the beerhall. Anyone willing to help Tawanda, or who would want to know more about his ordeal, kindly get in touch with him on his mobile number +263776999722, or visit him in Domboshava in Makumbe village.